In order to display your clothing and accessories exactly as you desire in your wardrobe, structured planning is required. That is where we come in. At Boston Closet, we understand a homeowner’s desire to build the closet of their dreams. However, it is more than just something that can be built. It must be maintained and ordered properly! That is why we are here with a few ideas on how to organize your dream closet. Mirror – One of the most important aspects of a closet is being able to see the overall look of an outfit once it is chosen. That’s where the mirror comes in. However, these have been known to be bulky and take up room. That is why we offer a fold-away mirror to help save space. Or, consider a full length mirror that can be attached to the back of the door. Either way, we will construct different mirror options to specifically fit your desires. Shoe shelves – When shoes are piled on top of one another on the closet floor, they can get damaged and are difficult to keep track of. Shoe shelves, however, allow for sandals, high heels, boots, etc. to be stacked on different levels for optimal organization. This ensures that they are taken care of, easy to see, and well maintained. For all of the shoe lovers out there, we can also create an entire wall dedicated just to shoes! The choice is yours. Drawers – For clothing items that are a bit more durable, consider using drawers for storage. Put casual clothes such as t-shirts, workout clothes, and more here. This will help to also conceal clothes that would otherwise be an eyesore in the closet. Save hanging space for nicer items. Dirty clothes – You want to avoid any type of see-through bag when it comes to a hamper. You also want to avoid piling dirty clothes somewhere in the bedroom. Rather, we want to hide dirty clothes that might otherwise be thrown on the floor for display! Tilt-out hampers are an ideal way to store dirty clothes until laundry day. This way, they remain in the closet but are not visible. The dirty clothes will be out of mind, out of sight until they finally go through the wash.
Professional attire – Perfect way to hang suit jackets, button downs, or fancier dresses is with a valet rod. Use this smaller hook to hang your outfit for the next day. Or, simply show off your favorite clothing item for all to see. Then, for slacks, ties and other professional attire, consider sliding tie and pant racks. This will help keep the pants from wrinkling. It will also ensure that all professional attire it properly hung and managed for the finest caretaking. Accessories – Racks with hooks are an ideal way to hang accessories. These might include belts, hats, scarves, necklaces, etc. It is important to ensure that these items are hung rather than rolled or folded up in a drawer. However, another option is to use mannequins. Upper body mannequins are a beautiful way to put accessories on display. Wrap a scarf around its shoulders and top it off with a hat! 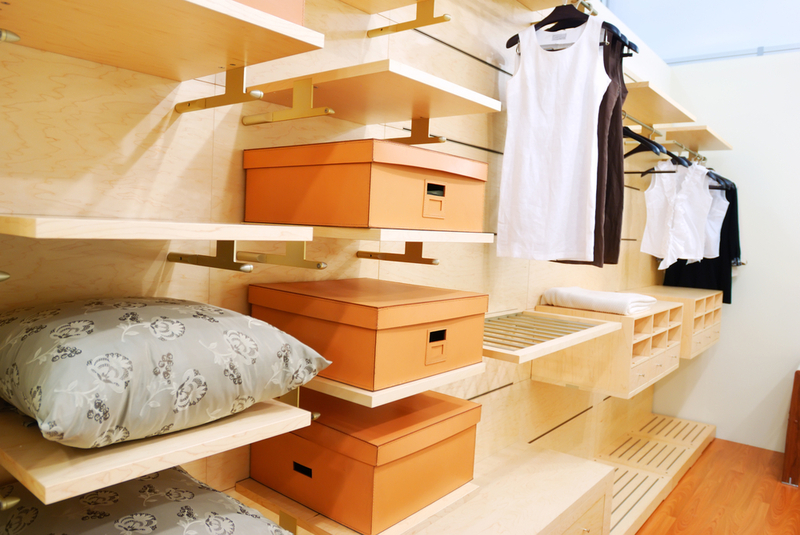 We hope that these tips on closet organization and clothing care will help you build and maintain the closet of your dreams! For any other interests in creating custom areas for your home, please do not hesitate to contact us today.